In spite of the official anti-Jewish legislation, in Venice, Florence, and Rome and in many other Italian and European cities hosting a ghetto, Judeo-Christian human, cultural, intellectual and nonetheless artistic interactions were inevitable. Music probably much more than any other form of artistic discipline expressed the permeability of the ghetto's walls, the repertoire of one community becoming - often involuntarily, unconsciously - patrimony of the other one, traditional monodic Jewish tunes resounding in the polyphonic fabrics of ecclesiastical cappella music, secular Gentile tunes (often those of very obscene popular songs) accompanying some of the most sacred moments during the Hebrew liturgy. Jews from the Middle East were transplanted to Italy as early as Ancient Roman times, as Jews expelled from Spain found a home there after 1492. Italian Jewish communities incorporated descendants of both Sephardic refugees as well as those of slaves brought back from Judaea by conquering Roman armies. That the Jewish presence in Italy was characterized by the familiar and precarious balance between assimilation and exile is well known to us. What is less commonly explored is the cross-fertilization between Jewish and Christian musical cultures, and the impact this exchange had on mainstream compositional voices of the seicento. Salomone Rossi revolutionized sacred Jewish music and created an uproar by setting Hebrew texts to polyphony, a form considered too lavish and thus unbefitting a people in exile. Just as Rossi reshaped the music of the synagogue by incorporating the forbidden polyphony of the church, many Christian composers brought sweeping changes to their sacred music by absorbing sounds they heard from neighboring Jewish ghettos. Nowhere was this more prevalent than in Venice. Numerous Venetian sacred compositions reveal modes and melodies so closely associated with the synagogue that it is next to impossible not to bring up the comparison of Temple and Church. This is why this year's exploration, which goes beyond the work of Rossi, is called From Ghetto to Cappella. Francesco Durante was a Neapolitan composer known for his sacred compositions. His aria Vergin tutto amor has become engrained in the consciousness of classical singers everywhere due to its inclusion in the collection of 24 Italian Songs and Arias with which so many in the United States begin vocal study. The song is known to us as a pedagogical piece, and as it is uprooted from its historical context, we know Vergin tutto amor as an isolated work rather than as an excerpt from a mass or motet. However the phrygian mode discernable in the descending scale which sets the text O madre pia (merciful mother) is known as Freygish, common to Middle Eastern music and Hebrew prayer. Because so little is known about Durante, how the Freygish made its way into this setting of a most Catholic text is an intriguing mystery about which we can only conjecture. 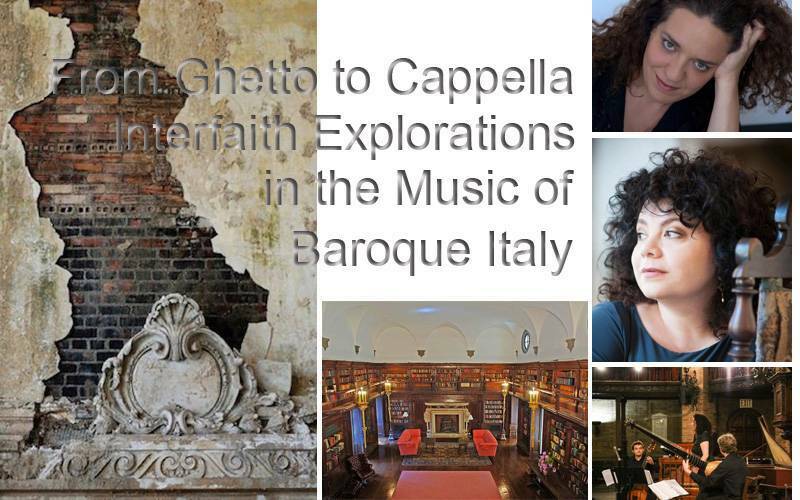 NYU Casa Italiana Zerilli-Marimò welcomes a new collaboration with the "bold and enterprising" (Time Out New York) early music presenter Salon/Sanctuary Concerts, recognized for innovative interdisciplinary projects which view history through the prism of music. Our new partnership provides us with a welcome opportunity to explore the roots of another very popular facet of our programming - Italian opera. While many early music presenters and practitioners champion a specious oppositional relationship between the vocal technique of 19th century opera and so-called "early music singing," advocating a genderless and vibrato-free timbre that arose from English boy choirs as putatively "authentic," Italians have always known the origins of bel canto in Florence in the 16th century with the premiere of the first opera, evolving to the modern day operatic sound we recognize today through the consistent embrace of full-bodied and lustrous voices. As enthusiasm for the boyish timbres of the first wave of historical performance wanes, NYU Casa Italiana stands at the forefront with those most familiar with the 400 year old Italian operatic tradition. A versatile artist with an affinity for many musical styles, Noa Frenkel is a true contralto with an extensive vocal range. Her concert repertoire reaches from Renaissance to contemporary music. Recent concert appearances include Händel's Dixit Dominus with the Flemish Radio Choir, Donatoni's Abyss in Casa da Musica in Porto, Luigi Nono's Prometeo at La Scala-Milan, Holland Festival, Lucerne Festival, and the Berliner Philharmonie; Mahler's Das Lied von der Erde with the Orchestre Symphonique de Mulhouse, Verdi's Requiem at the Ljubljana festival, Mahler's Symphony No 2 with the Israel Symphony Orchestra Rishon Lezion and Nono's Guai ai gelidi Mostri at the Salzburg Festival. Most recent opera appearances include world premiere of the complete version of Stockhausen's Sontag aus Licht at Opera Köln, Pnima by Chaya Czernowin at Opera Stuttgart, Tod eines Bankers by Andreas Kersting in Theater Görlitz, Woman in Zaide/Adama by Mozart/Czernowin at the Salzburg Festival, Frau Ocholowska in world premiere of Johannes Kalitzke's Die Besessenen at Theater an der Wien, Third lady in Mozart's Die Zauberflöte at the Opera of Nantes and Angers, Madame Flora in Menotti's The Medium with Opera Rotterdam, La Maestra delle novizie in Puccini's Suor Angelica with the Bochumer Symphoniker, Philip Glass's Akhnaten in Rotterdam, the Madrigal Opera La Barca with the Nationale Reisopera in Holland and Belgium and a new production of Zaide/Adama at Theater Bremen. Frenkel has appeared with Baroque ensembles such as Les Arts Florissants, Elyma Ensemble, Combattimento Amsterdam, and the Utrecht Baroque Consort. Ms. Frenkel had the pleasure to work with conductors such as Ivor Bolton, Reinbert de Leeuw, Ingo Metzmacher, Kenneth Weiss, Kenneth Montgomery, Dan Ettinger, Ilan Volkov, Friedemann Layer, Gabriel Garrido, Peter Dijkstra, Emilio Pomarico, Jos van Veldhoven and Steven Sloane. One of Italy's leading lutenists with over 100 recordings to his name, Diego Cantalupi studied classical guitar with Mauro Storti. Parallel interests in renaissance, baroque and pre-romantic music led him to study early performance techniques following courses in lute-playing at the Ancient Music Department of the Civica Scuola di Musica in Milano (Paul Beier) and at the Conservatorio in Parma (Andrea Damiani). In 1996 he was awarded a degree with honors in Musicology from the Scuola di Paleografia e Filologia Musicale in Cremona. He performs regularly as soloist and continuo player with leading period instrument ensembles worldwide, such as 'La Venexiana', 'L'Arte dell'arco', 'La Verdi Barocca', 'Divino Sospiro', 'Accademia degli Astrusi', 'Il Capricio'. He is the founder and director of the 'Ensemble L'Aura Soave', whose repertory and instrumentarium is based exclusively on his research. Equally at home working with modern instruments, Diego has performed with many leading orchestras including 'Solisti Filarmonici Italiani', 'I Solisti Veneti', 'Kammerakademie Potsdam', 'I Pomeriggi Musicali', 'Streicherakademie Bozen'. His repertory spans many centuries, and his discography ranges from some of the earliest surviving lute works to the contemporary theorbo and lute works written for him. An experienced teacher at all levels, Diego Cantalupi teaches lute at the Conservatorio di Bari, and on many summer schools and courses; he is regularly invited to serve as specialist examiner by both universities and music conservatoires. He is currently preparing the first modern method for theorbo. Born in Croatia, lutenist Diego Leverić currently studies in the Musicology program in Cremona with the University of Pavia. Fascinated by the world of ancient music he has begun studying the Renaissance lute, the theory, and Baroque guitar with M° Maurizio Piantelli. He is currently pursuing a master of baroque lute in conservatory of Bari with M° Diego Cantalupi. He has participated in masterclasses and private lessons with the greatest lute players of today: Hopkinson Smith, Paul O'Dette, Eduardo Eguez, Andrea Damiani, Massimo Lonardi and Xavier Diaz-Latorre. In 2011 he won third prize (first prize not awarded) in the first edition of the lute competition Maurizio Pratola, in L'Aquila, Italy. The following year, in the second edition of the same competition presided over by Paul O'Dette, performing on renaissance lute and theorbo he won first prize in the solo category and first prize in the overall category of "chamber music" with the duo Sursum Corda. He is one of the winners of the international competition "Concursos Internacionaisde Jovens Interpretes de Musica Antiga" in Lisbon, Portugal. As an ensemble musician, he has performed under the direction of Claudio Scimone, Martin Gester, Marco Mencoboni, Federico Ferri, Andre de Carlo, Joachim Fontaine, and Diego Cantalupi. He performed as soloist and in ensembles throughout Europe: Belgium, Croatia, France, Italy, Germany, Turkey, and Switzerland. He has recorded for labels Arcana, Naive and Marcello Villa Cremona. He is also featured in a video recording is with singer Renato Dolcini in the realization of a documentary on Claudio Monteverdi which was filmed inside of the Ducal Palace of Mantua for the television station 3Sat. Casa Italiana Zerilli-Marimò at NYU, Free Admission, Reservations Required.